$5,990.00 Gold Medal of Hero of DPRK, Type 1 Var. 1, #547, circa early to mid 1950s issue. An extremely rare Korean War issue with the serial number, in excellent condition. $2,800.00 Gold Medal of Labor Hero of DPRK, Type 2, Var. 5, circa 1950s- 60s. Early screw back type. Very scarce version in excellent condition. $2,400.00 Gold Medal of Labor Hero of DPRK, Type 2, Var. 6, circa 1950s- 60s. Early screw back type. In very fine to excellent condition. $190.00 Chollima Honor Prize, Type 3, late 1960s - early 1970s. At one time given out each year to "Twice Chollima Worker Teams or Factories". Very fine condition. $1,700.00 Order of National Flag, 2nd cl., Type 2, Soviet-made screw back in silver, #5608, 1950s issue. A superb example. $195.00 Order of National Flag, 3rd cl, Type 3 Var. 2, early screw back version of Czech manufacture, #6383, circa 1950s-60s. In excellent condition. $90.00 Order of National Flag, 3rd cl, Type 4 Var. 4, #77558, circa 1960s. Probably of Czech manufacture, this well-made version in silver features horizontal pin and counter-relief to the star with "stubby" points. In excellent condition. $540.00 Order of Soldier's Honor, 1st cl, type 1 (Soviet Mint-made screw back in solid silver), circa early 1950s. Very fine to excellent condition, with only minor wear to enamel and well preserved original gilt. $95.00 Order of Soldier's Honor, 1st cl., Type 2 (pinback with flat reverse). Scarce early issue featuring fine quality enamel. In near mint condition. $290.00 Order of Soldier's Honor, 2nd cl., Type 1 (Soviet-made screw back in solid silver), circa early 1950s. In excellent condition. $3,600.00 Order of Labor, Type 1 (Soviet-made screw back), #926, 1950s issue. Very large and magnificent piece in silver gilt with high quality enamels. In very fine condition. $595.00 Order of Labor, Type 3 ("Old Design" with vertical pin), #17533, circa early 1960s issue. Note the extremely low serial number - some almost 41000 below the lowest number quoted in the McDaniel and Sessler catalog. Relatively scarce early version of the award in superb condition. $45.00 Order of Labor, Type 4 Var. 2 ("New Design" with vertical pin), circa 1970s-80s. In excellent condition. $165.00 Order of the Korean Army Foundation Commemoration, Type 1 (screw back), #4588, circa late 1960s. In outstanding condition. $70.00 Order of the 30th / 40th Anniversary Commemoration of the Founding of the DPRK. In excellent condition. $60.00 Order of Coal & Mining Industry Service Honor, 1st cl., Type 1 (early, better quality version in gilded brass). Excellent condition. $40.00 Order of Coal Mining Industry Service Honor, 2nd cl., Type 1 (in gilded and silver plated brass). Excellent condition. $35.00 Order of Coal Mining Industry Service Honor, 3rd cl., Type 1 (in silvered brass). Excellent condition. $160.00 Order of the March 5th Commemoration, circa late 1980s-1990s. Large and relatively well made piece in excellent condition. $20.00 Order of Military Service Honor, 3rd cl., Type 1, circa mid 1970s. "Smooth" reverse. Excellent condition. $20.00 Order of Military Service Honor, 3rd class, Type 2 (with relief reverse rays). Excellent condition. $40.00 Military Service Honor Medal, Type 1, circa 1970s-80s. In excellent condition. $275.00 Order of the Capital Construction Commemoration, 1992. In excellent condition. $80.00 Medal of the Capital Construction Commemoration, 1992. $130.00 Order of the Korean People's Army 60th Anniversary Commemoration. In excellent condition. $450.00 Order of Agricultural District Theses Publication 30th Anniversary Commemoration. Est. 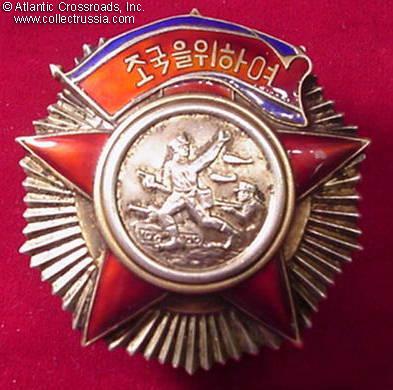 1994, this is one of the more scarce DPRK awards of the post-Korean War era. In excellent condition. $70.00 Korean Liberation Commemoration Medal, late 1940s. One of the first awards of North Korea, awarded to Soviet soldiers who had fought in Korea against the Japanese in the last days of WW2. In very fine condition. $90.00 Award Certificate for a Korea Liberation Medal, issued in December 1948 to a Red Army Jr. Sergeant. In very good condition. $95.00 Military Merit Medal, Type 3, circa 1950s. A relatively scarce version from the Korean War era. In excellent condition. $90.00 Military Merit Medal, Type 4 Var. 2, circa 1950s. Soviet-made issue in solid silver. Unlike all other versions of the medal, this variation has eyelet "stepped back" as opposed to being flash with the rest of the reverse. In excellent condition. $80.00 Mt. Kumgang Power Plant Construction Commemoration Medal, circa late 1990s. Est. in 1996, this medal is among the less common North Korean awards of the recent period.